Documented and assisted in the development of internal processes for the entire company. 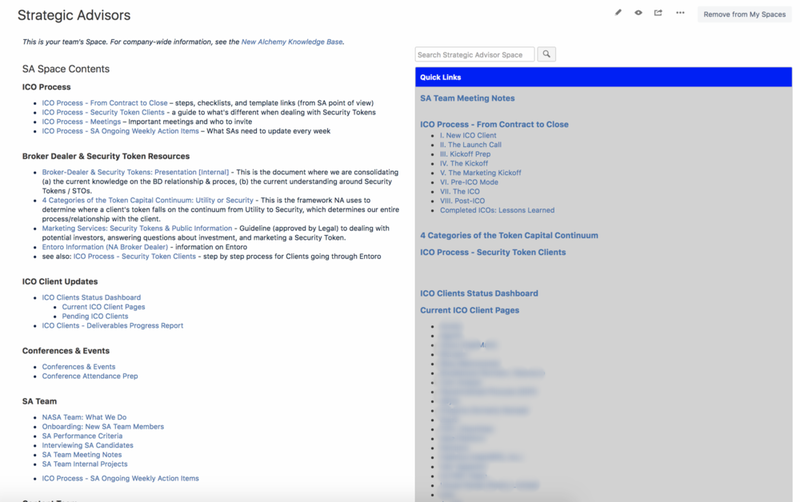 Managed the internal wiki in Atlassian Confluence. Quickly learned about blockchain and ICOs, including understanding the technical aspects and communicating the benefits to our clients’ wide range of industries. Wrote content for our clients, including white papers and investor pitch decks. Contributed advice and feedback to clients during both in-person and remote meetings. Led internal effort to evaluate project management tools for cross-team collaboration. Promoted in July to the Research team to build out internal training and blockchain education. Assisted team manager in organizing priorities and tasks for the team. Became valued contributor as the team developed new client services, including getting cross-company buy-in to initiatives, creating a project plan, and writing SOWs for Sales team. Unofficial leader of crafting company culture. Independently organized company events, such as happy hours, karaoke, and book club. I write user documentation for BlackLocus, the innovation lab for The Home Depot. BlackLocus develops an internal pricing tool for The Home Depot. I convert Github tickets and chats with Product Management into comprehendible user documentation and on-boarding videos. I also write documentation for internal processes for the BlackLocus Support team. Originally based in Austin & now continuing to work remote (part-time) in Seattle. Write/Maintain the user guide in Atlassian Confluence for internal Home Depot pricing tool. In Spring 2017, moving the entire wiki to internal THD Confluence to better integrate with Home Depot's internal processes. Collaborate daily with SMEs: product managers, engineers, UX designers, and support team. Write documentation for all internal processes for the BlackLocus Support team. Project management: Use JIRA ticketing system to organize. Incorporate my knowledge of HTML/CSS and SQL. Heavily use Techsmith SnagIt & Camtasia to add visual aids to documentation, including animations. Create high quality on-boarding videos using Adobe Premiere and After Effects. The Home Depot then recruited me to build training videos for other internal tools too! I wrote the content for all of the pages in the Page Tree on the Left Side. Content on the Right side is the current view of page selected. I also engineered the Search of specific sections of documentation and the "Quick Links" navigation, for ease of use. Screenshot: Another Confluence page in BLKX with screenshots.